Ah, spring break! It’s a time when children take one week off of school for a well-deserved break! With that in mind, don’t let another day pass out of boredom. After all, you only have one week to spend a full day with your children so make the most of it! The following are activities you should do for Spring Break! You don’t have to get away from the city to have lots of fun. Turn your backyard into a fun “getaway” so you can play different kinds of sports like volleyball or Frisbee. A good ole’ Slip N’ Slide can be a great hit for them too! 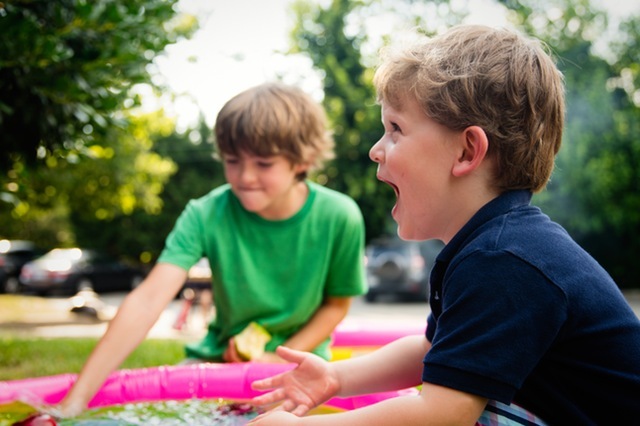 Even a water balloon fight can keep the children entertained for hours. Get creative and brainstorm fun activities they’re interested in. There’s no such thing as spring break without going to the beach! With months of summer behind, it’s time to welcome the sun’s rays as you play and relax at the beach. After all, there’s nothing more enjoyable than to see the waves crashing, bright sun and sand on your toes! Besides having fun, teach your children some simple ways to be selfless. This is the perfect time volunteer by cleaning up the litter in the neighborhood or helping an elderly neighbor. Let your entire family choose what kind of activity they would like to participate in. Many cities will have interesting and odd attractions. For example a wax museum in Las Vegas, or Dinosaur World in Florida. Many of them are all over the city, and it’s just a simple Google search away! Don’t forget your camera for this activity because it will be loads of fun! There’s nothing grand than to see a National Park. During their spring break, take a walk with nature as they have fun hiking and sightseeing. With this getaway, national parks offer tons of explorations for the entire family. So get out there and start your adventure. With all the big activities throughout the week, it’s best to unwind with a movie. They’re cheap, and they’re relaxing! Have your children pick a movie they want to see, and have fun. For this activity, you don’t have to go to the theaters if they want to see something at home. When you go this route, have a movie night filled with snacks like popcorn! Start them young by teaching them how to cook. There’s nothing like growing up learning how to be good in the kitchen. Grilling is a wonderful time to spend some time together with the family as they become masters in the yard! Of course, take it easy on the tasks because safety always comes first! Perhaps, they can help by watching the grill instead of turning the meat.